My life, as a student of bamboo, began when my father became a bamboo craftsman. When my father was in a fifth grade at primary school, he had osteomyelitis. 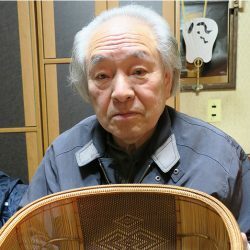 For his treatment, he moved from a mountain village of Northern Oita to Beppu, and took a career to become a bamboo craftsman in the early Showa era. I was born in 1942 at Beppu, the home of bamboo growing, and grew up there. I went to Beppu Midorigaoka High School to study bamboo craft. My teacher then was Mr. Shimoda who studied under Master Shono Shounsai, a Living National Treasure of Japan. Meeting with Master Shounsai determined my life. For forty days of my summer vacation during my senior year, I went to study bamboo craft under Master Shounsai. After I finished my high school, I apprenticed him for two years. It was a very difficult two years. Master Shounsai was so great an artist that I felt I was nothing. I felt so inferior and hated myself. It took me well over ten years to get over my feeling. After ten years of struggle, I turned to myself that after all; I can only be myself. Nothing more, nothing less. I assumed a defiant attitude toward myself, of course not to my master. Master Shounsai passed away in January 1974. “It takes a lot of patience to craft bamboo, so you need a wife with lots of patience.” He said this and introduced me to my wife. I owe great debts, but I could not repay anything to him. Only what my wife and I can do is to pray for the repose of his soul. I was admitted to Japan Traditional Art Crafts Exhibition for the first time in 1976. Since then, I have met many influential people. Especially, I am grateful for Master Iizuka Shokosai who has been helped me for twenty some years. I learned the foundation of my mental preparation towards my work from him. One can never master everything about the art of bamboo. The more you learn, the harder it gets. I struggle every time to craft bamboo to establish my own style of bamboo art.